Instashop is a fictitious grocery franchise based in the United States. Over the past few years, Instashop has been facing decreasing market shares. 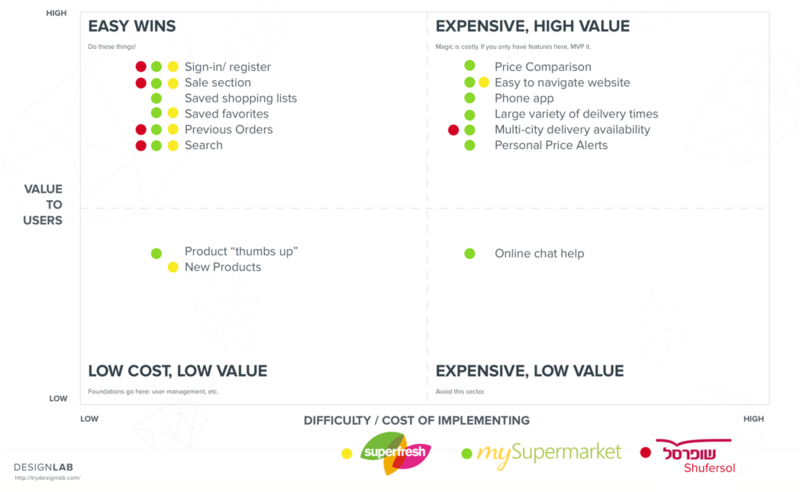 User and market research have determined the cause of this decline to be an increase in popularity of online grocery ordering with product delivery. Instashop believes that if they provide their customers with the ability to shop online, they will be able to increase their customer base and market share. 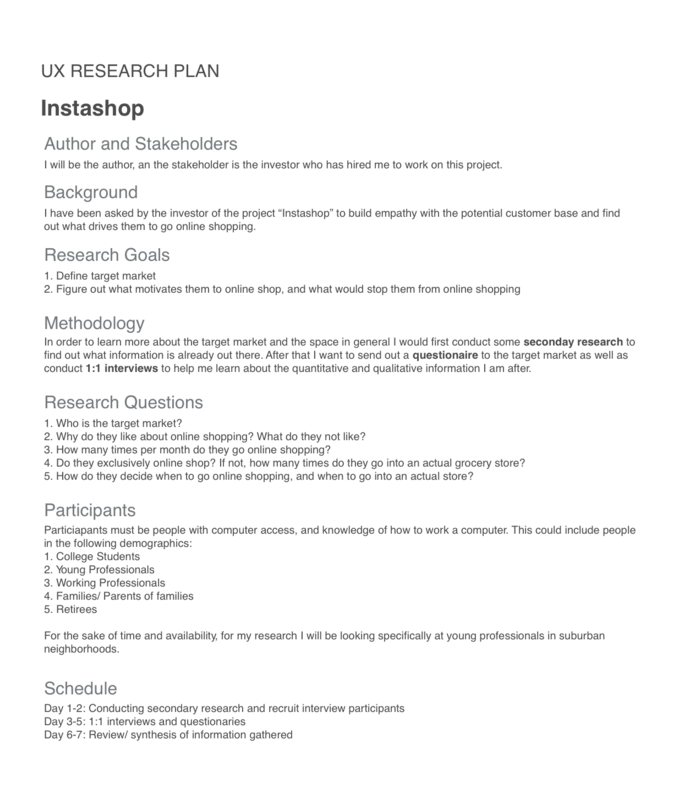 The Research Plan was created in order to help define the target market as well as to discover their motivations with regards to online shopping. First, secondary research was conducted to learn more about the product space and target markets that already exist. Based on those findings, research questions were compiled and organized into online questionnaires and 1:1 interviews. For the sake of time and avilability, the demographic focus for all primary research particiapnts were young professionals in suburban neighborhoods. 5 particpants were interviewed and 17 participants responded to the online questionnaire. 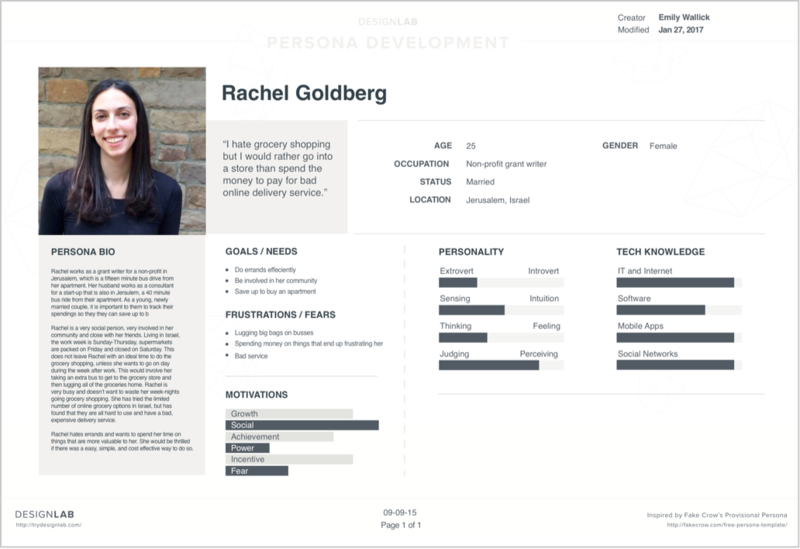 By looking through the behavioral patterns in the data collected through research, Rachel Goldberg was created as an potential user persona. With this user persona, I can more easily address the needs and goals of the ideal user group. 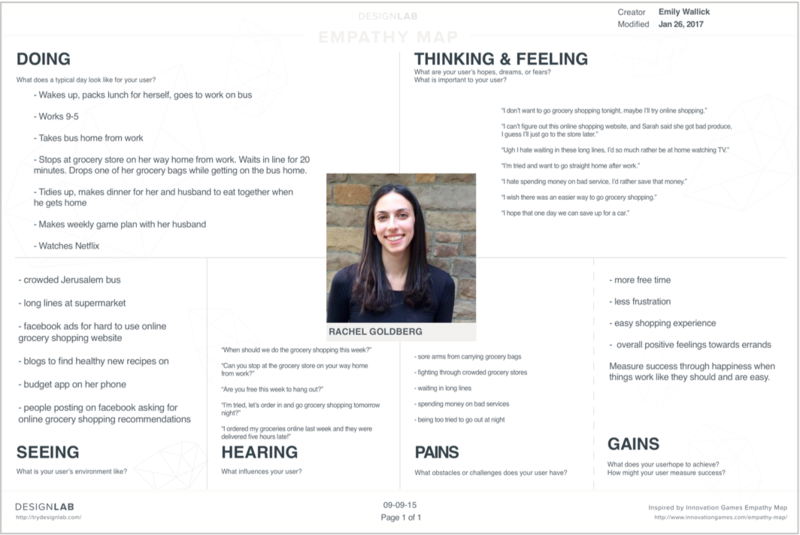 Empathy maps help to understand the emotional state of the user and the world they live in. They drive a human rather than technical view of a product or project. An illustration to better understand the current user's experience. The user is tired and wants to go straight home after work, but first must pick up groceries. She takes a bus to the crowded grocery store and has to wait in a long line to checkout. After carrying all of her bags with her back home on the bus, she must then put her groceries away; finishing the whole process exhausted. The Competitive Anaylsis plots the features of the three main competitors according to cost and value. 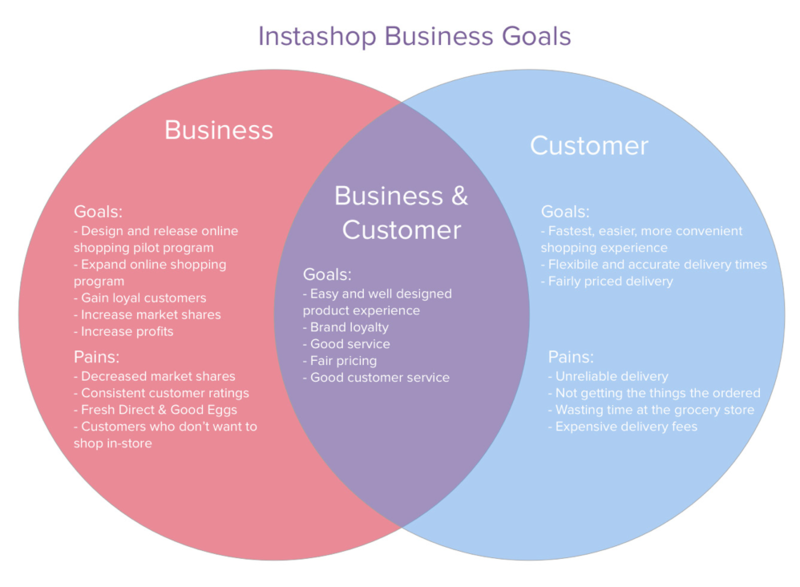 The competitive analysis, along with my previous research, also assisted in the creation of a feature matrix for Instashop. A chart listing the business's goals, the user's goals and overlapping goals. Knowing this helps keep all perspectives in mind in order to create a product that is beneficial for everyone. I conducted a card sorting exercise in order to see how potential users naturally categorize food items. 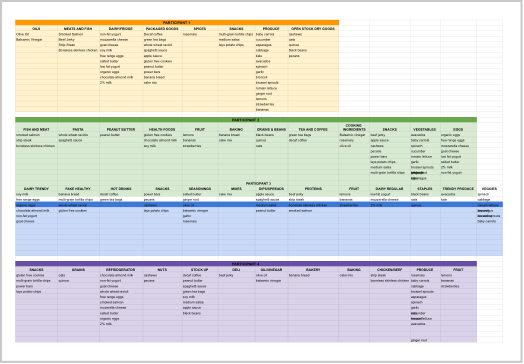 Based off this exercise, I created a sitemap to show the content, categories and organization of the site. 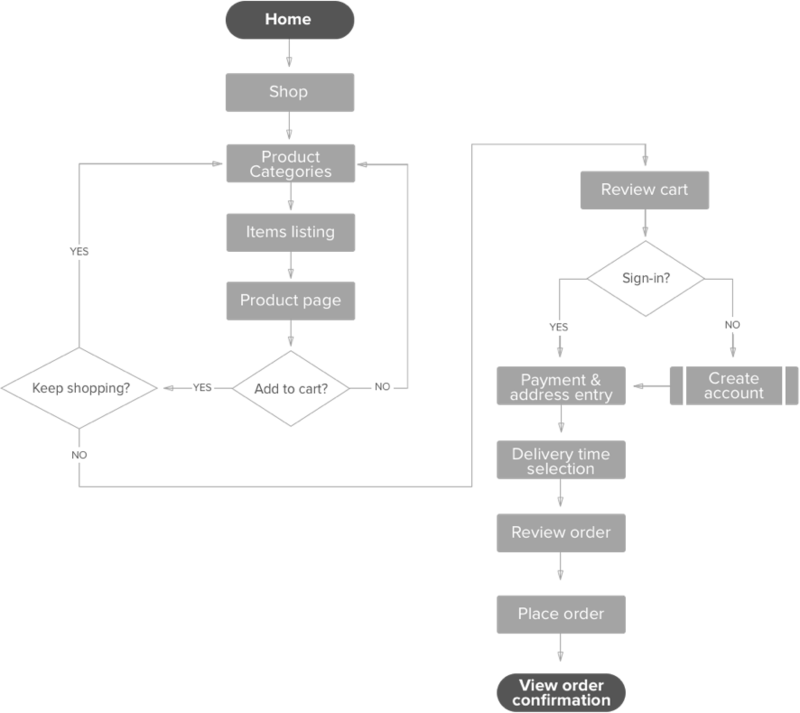 The User Flow visualizes the path a user would take to complete a task. In this case, the flow is mapping out the path posiblities from entering the site homepage through completeing an order. 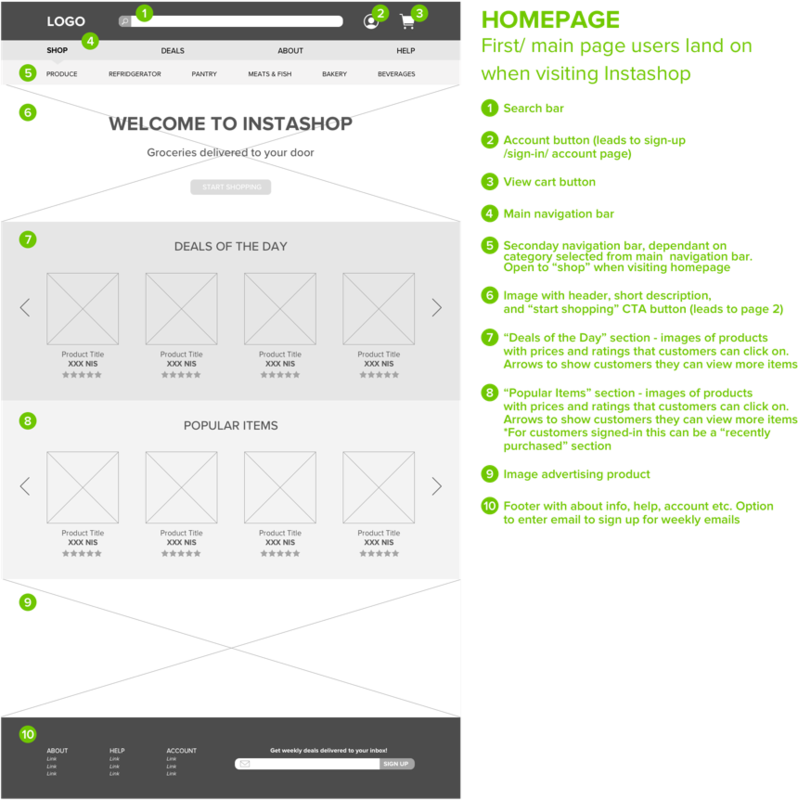 Wireframes were created based on the site map, user flow and feature matrix. The wireframes contain annotations to describe key features of the page. Wireframes for tablet and mobile were made to refelct the adjestment in screen size. 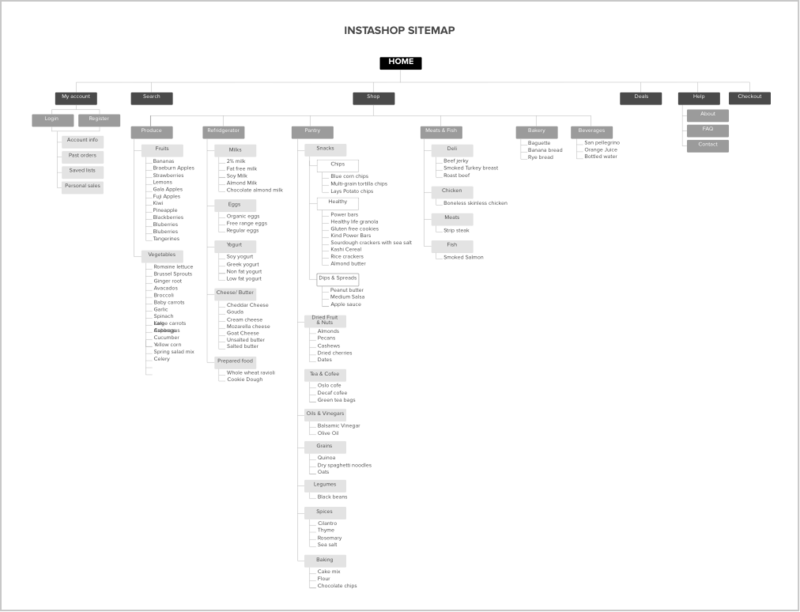 Wireframes were combined to create interactive key user flows. First, a rapid prototype for mobile was created using MarvelApp. After that, a more detailed low-fidelity wireframe for desktop was created using Invision. This prototype followed the whole process as originally outlined in the User Flow. 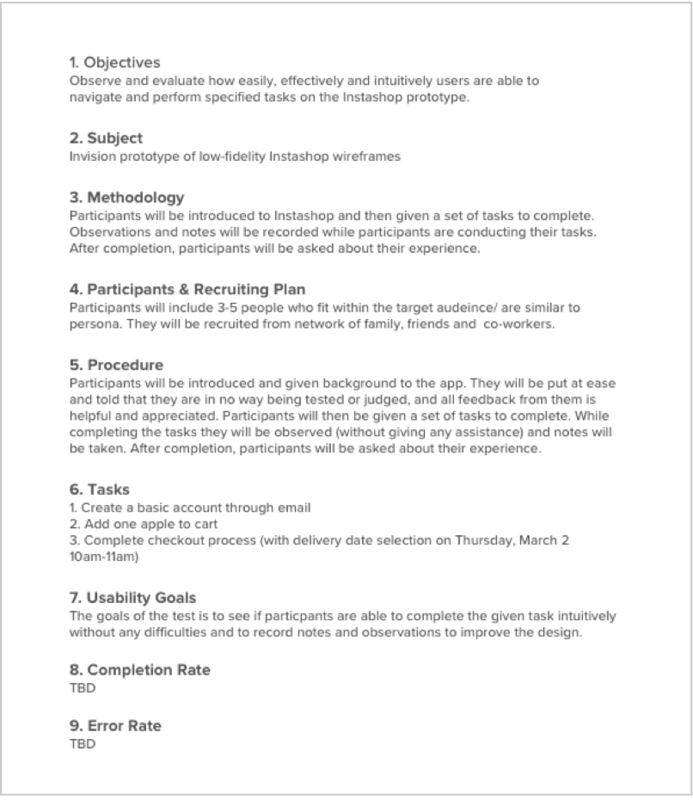 Before sending the protype out for testing, a usability test plan was created in order to outline the process and goals for the protoype testing. Both in-person and remote user tests were completed. In person, 5 participants were asked to add an apple to their cart and complete the checkout process using an Invision prototype. Four tests were conducted remotely, with responses from a total of 22 particpants. Using Verify; a click test to see where people naturally go to find an item and a memory test to learn the most memorable elements of the homepage. Using UsabilityHub; a click test to see what a participants first move in on the site without any instructions and a preference test between two types of "add to cart" buttons. An affinity map was created to organize the positive and negative feedback and takeaways from the user testing. The next steps include creating a visual identity for Instashop, further creation and refining of prototypes for existing and new user flows and a high fidelity prototype.